Self-Catering, Clean Rooms with fully fitted Kitchen, TV, DVD Player, Access to pool, Laundry Service, Secure parking, Bird-life, Horses and Tranquil Environment. Pool, Laundry Facilities, Daily Cleaning, Secure parking, 24hr Security, Garden, Braai facilities. Plenty to do in the surrounding Benoni Area - from Golf Estates to Casinos, Malls, Restaurants, Bunny Parks and more. A fully fitted kitchen - Fridge/freezer, toaster, microwave, kettle, induction plate & cutlery. Bedding, towels, heater, fan, hairdryer, TV (Satellite Channels, DVD player and amenities. Free – first night complimentary 350ml bottled water & coffee. Separate kitchen, shower and toilet. Imbasa Lodge – Self Catering Accommodation. Affordable accommodation in Benoni the East Rand Gauteng and very close to OR Tambo Intl. Airport. Imbasa Lodge – Self Catering Accommodation, is ideally situated just off the N12 Freeway / Highway and close to OR Tambo International Airport. Close enough for easy accessibility, but far enough not to be disturbed by the noisy airplanes. We are situated in a very quite area of Benoni on a 5 Acers property or a Small Farm in the Benoni Area, East Rand, Rynfield AH, Gauteng, Area. The property has beautiful big trees and lots of birdlife. Most of our Guests stay for longer periods when they are on business, holidays or just need to be in and around the greater Gauteng region. Whether you are just sleeping over for a business trip, staying for months, renovating your home or having a romantic getaway. We have the perfect accommodation for you. Being close to Kempton Park, Boksburg, Brakpan, Springs, Delmas, Petit and Bapsfontein makes our location ideally for travellers or businessmen. We pride ourselves in offering affordable accommodation with the key focus on exceptional service and cleanliness. We know how frustrating and tiring the constant flights, drives, bad service and bad food can be so we developed accommodation where the key focus is on our guests. When staying with us, you will receive great service, a clean environment and good comfortable beds. A home away from home! Are you globe-trotting and looking for a clean, relaxing and safe place to stay? Imbasa Lodge is the perfect place to stay, come and put down your luggage, have a hot shower and kick up your feet after spending time travelling. Come and enjoy our onsite swimming pools so you can cool down in the hot summer months of South Africa. We are situated in a safe, tranquil and peaceful area and are secured with remote access and Parking inside the property. Come and enjoy your stay with us and let us spoil you! We are very proud of our clean and peaceful self-catering accommodation when you need a good night’s rest. The main reason accommodation in Benoni is so popular is the fact that it has stunning residential areas close to OR Tambo International Airport, approximately 20 minutes, has direct access to all major routes. Johannesburg and Pretoria is less than an hour’s drive away offering a myriad of historical attractions. It is ideally situated on the main routes to the Kruger National Park, Cradle of human kind, Goldreef City, Pilansberg and the infamous Sun City. Benoni, Kempton Park, Boksburg, Brakpan, Springs, Delmas, Petit and Bapsfontein boders on each other and are in very close proximity to each other. Various Sports facilities including Sahara Park (Willowmore Park), home to the Titans, Easterns Cricket. On our doorstep you will find John Barreble Hall, who hosts a myriad of sport events through the year. Benoni Northerns Sport Club and St Dunstan’s,hosting the SA Hockey yearly. Training and conference venues near us include the Birchwood Hotel who hosts various conferences as well as the Kapanong Hotel. Business hubs near us include Jet Park, Isando, Bardene, Bonaero Park, Pomona, Glen Erasmia and Dunswart. Horse lovers can enjoy equestrian Estates like the beautiful Dunblane Equistrian Centre and The Willows stable yard. For the adamant golfers, we have Ebotsi Golf and Country Estate, Benoni Country Club and the Royal Oak Country Club near us. Various Malls and offer a lot to keep you busy during your stay with us. Casinos near us include the ever famous Emperor’s Palace in Kempton Park and Carnival City in Brakpan. Need more information about our home away from home accommodation in Benoni? Then contact us today. Check if your dates are available, and make your booking before space runs out! If you do not see the booking calendar below, please click here. 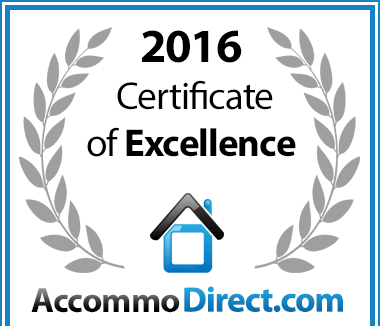 In recognition of exceptional service Imbasa - Self Catering Units in Benoni, Gauteng is hereby awarded a Certificate of Excellence.